In October 2014 the Munduruku indigenous community began the self-demarcation of the Indigenous Land (TI) Sawré Muybu, located on the right margin of the Tapajós River in the Brazilian Amazon . 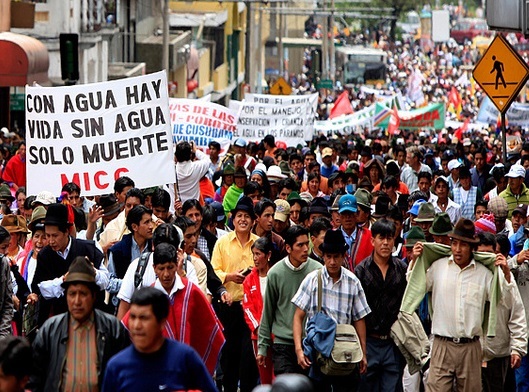 The traditional land occupation by the Munduruku has already been recognized by the National Indian Foundation (FUNAI), in a report concluded in 2013. However, the document, which identifies and defines the Indigenous Land  and the process of Sawré Muybu, is still inactive, only waiting for the authorities signature to officialise their Indigenous Land. 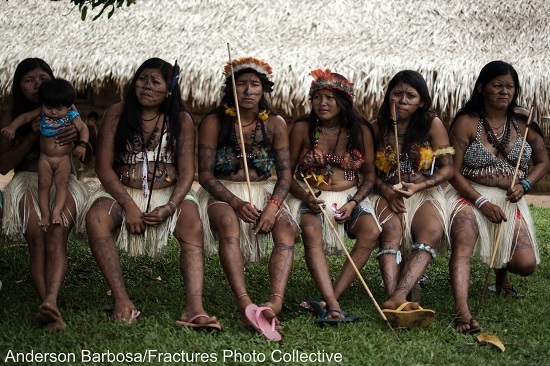 Not even orders of the Brazilian courts to immediately resume the demarcation were enough to unlock the process and ensure the constitutional right of the Munduruku on their land. The reason: Brazilian government wants to implement at any cost, across the Tapajós Basin, a hydroelectric complex that includes a power plant inside the Sawré Muybu region. In September 2014, the then president of Funai Maria Augusta Assirati admitted to the Munduruku that it would be the reason to stop the process . Knowing the political limits, tired of waiting for the government to fulfil its role and concerned about the damage caused by land invaders (loggers, land grabbers, palmiteiros and others), the Munduruku decided to make themselves the demarcation and protection of its territory. Since they began, they published three letters (1st, 2nd, 3rd) among other documents. Other resources on their struggle include the self-demarcation blog, a documentary about the Munduruku dispute by Nayana Fernandez, and a photo series by the photojournalist Anderson Barbosa – “Munduruku, Taking the Power Back”). Read the “IV Land-marking Letter” below, written by the Munduruku in Sawré Muybu village. Please support this struggle, helping to circulate the words of these warriors. We Munduruku, from the upper and middle Tapajós River, are continuing the second stage in the demarcation of IPI WUYXI IBUYXIM IKUKAP- DAJE KAPAP EYPI. After five days in the forest, we have marked six points in our process of self-demarcation and have witnessed the traces of destruction made by the invader-burglars of our lands: loggers, palm cutters and land-grabbers. On the second day, while following the loggers’ tracks, we struggled to find food. It had been two days since we found any game. We know that the noise of tractors, chainsaws, and the movement of people along the paths drives the game animals away. These animals cannot stand the smell of humans. We mention it because we have observed this happening during the self-demarcation of our territories. After going along the loggers’ dirt road, we saw a trail and a bridge, which they had built to carry away the wood and açaí palm heart. We also found their fields. The trail is a road made to haul wood and palm trunks. Now that we are marking our land, we have realized that this is happening within our territory. We see the destruction that people are doing to our açai areas. It all starts with the loggers. They clear a path and the palm cutters follow and destroy the açaí areas. We were preserving these areas in order to harvest the fruit for our grandchildren, but now we find that we have almost nothing left in our land. We meant to harvest the fruit here to give juice to our children, and now we find only destruction. We always say that the pariwat (non-indigenous person) lack knowledge of these things. The reason why we are demarcating our land is that the pariwat are destroying the trees. We do not do things their way. The intention of the federal government and the pariwat is to destroy, and ours is to preserve. Why do we preserve? Because this heritage was given to us by our warrior Karosakaybu. The land is our mother from which we obtain our survival and where we can live in accordance with our culture. Daje Kapap Eypi is a sacred place to all the Munduruku people, from both the upper and the middle Tapajós. We must preserve our nature, our rivers, our animals and our fruits, left behind by Karosakaybu. We are demarcating our territory in order to show that this land is ours, so that white people respect it. We want to have autonomy in our own land. We want us, indigenous people, to be the inspectors and protectors of this land as we have always been. July 11, 2015, Sawre Muybu Munduruku village, Middle Tapajós River.